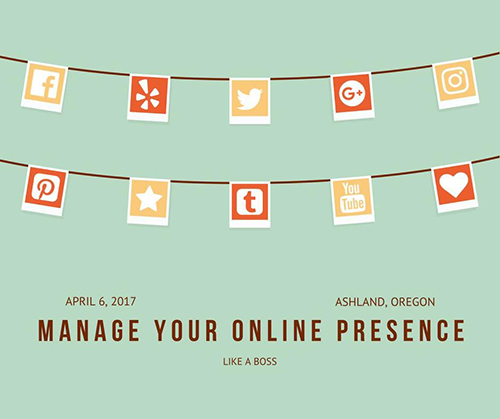 On Thursday, April 6th, the Ashland Chamber, in partnership with the City of Ashland, will be holding a workshop called “Managing Your Online Presence” presented by local Chamber members, Becky Brown of iWrite and Jim Teece of Project A and Ashland Home Net. The workshop will be held from 10:00am to 11:30am at the Community Center and will cost $10 for Ashland Chamber members and $20 for non-members. Coffee and tea will be provided. The workshop is designed to help business owners manage their online content and voice across varying online platforms, making sure your business is represented as you would like. Learn how to manage compliments and critiques on review sites such as Yelp! and turn negative experiences into new sales.